Can Blogging Help My Business and Should I Have one? How can having a blog help my business? But can also make you profitable and get you more customers for your business. Or into team members if you’re in Network Marketing. If there’s any confusion about what a blog actually is… then let’s get that out of the way. Some people I know aren’t sure if there’s a difference between a blog and a website. It’s a way to be able to share information with your audience through blog posts but can also serve other purposes, which is what I’ll be sharing with you shortly. It’s a site that is yours, that you control which gives you much more power over how you build your business. A blog is just one part of your website where you share informative posts and educate your readers, but it’s on a website. You’ll see on my own site, that this part is the blog with what you’re reading, but I have other options on my site too. Essentially, they’re one in the same thing. If you’re an online store and don’t have a blog with your site, then it’s just a website! Anyway, hopefully now that’s covered and clearer if you were unsure, let’s get into the nitty gritty. Why you should have your own blog/website? With your company replicated website, there is minimal mention of YOU. It’s all about the company obviously, but there is no way to get to know you as their chosen representative. They don’t know who you are… what’s unique about you and maybe you do something extra special for your customers but there’s no way of knowing. There’s nothing to distinguish you and the other hundreds of thousands of reps just like you from these sites. …you are instantly setting yourself apart from the masses, and people will see you as an authority. Have you ever read an article online and assumed that the person who wrote it knew their stuff and was someone worth listening to? But if you’re not utilising it in the best way, and have some crucial things in place, it’s not going to be as effective. I’ve already covered a few things earlier about you branding yourself and setting yourself apart. How does a blog actually get you more leads and customers? You’re going to be stuck on what to talk about. You’ll need to do some research and know what people are looking for help with. What questions are they asking. I cover how you can read your prospect’s minds in this other post you can check out in a sec too. This is a crucial part of making your blog help your business. Giving value means solving problems and that’s what your blog can do. Before writing this post, I did some research too and something people want to know is how can having a blog help their business. So here I am writing about it. They can find you and then you become an authority and someone they see and learn from. Think about your business and what products do you have? What benefits do those products provide? Share different things about your niche. General tips for your industry rather than be company or product specific. Let’s say you’re selling weight loss product in a network marketing company. What would people like to know about if they’re actively looking to lose weight? Share some tips you’ve learned. If you’ve lost weight yourself, what worked for you? With weight loss specifically, people are looking for easier & faster ways to lose weight. Ways to find healthy recipes that aren’t going to need them to spend a fortune at some health food shops and climb a special tree for a particular ingredient! Lol! Recipes are something I’m always saving into my Favourites for things to try. God I must have been annoying lol! Maybe you could share some meal ideas that the whole family can enjoy without needing to do multiple meals. Or some exercise tips that people can fit into their day or from home without a gym membership. What things do people who like make up want to know? How to have clear skin so they don’t need to wear so much makeup. There’s a LOT of questions that get asked online every single day. You might be wondering, Jenny, that’s great but how do I make money from it? That leads me into step 2! Have a way to get people who are reading your blog post, find out more about what you do. Plus have a way to follow up with them is what so many miss. You do that by building an email list. …but also gives you a way to stay in front of them... for a long time. Quite frankly, it’s a little lazy! It can work if you give away a discount like you may see on some ecommerce websites, people are selling products from their site. I take the discount and then unsubscribe! A better way to build your list is to offer something more tangible. The Lead Magnet is an irresistible ‘bribe’ that gives a specific chunk of value to a prospect in exchange for their contact information - usually an email address. And creating something you give away for free to download or watch in exchange for someone’s information. …who are willing to give their information for that solution. For some people, giving their email address is a big commitment and sign of trust. So if they opt in to get your freebie, they are putting their trust in you to provide that solution. You could even give away a physical sample of your product if you wanted to get product in hand. It has to offer a solution and something uber specific too. The more specific to your niche, the better. You can download my Quickstart Lead Magnet Checklist to help you ensure it has everything it needs to build your list well. I’ve built up thousands of interested prospects from doing this method so I know it works. No more trying to post on social media hoping that you get some comments wanting to know more. This gives you a solid and long-term way to always have new people to talk to. Great they’ve got themselves on my list, you may be thinking, but now what?! This was the piece that really changed things for me. Having something in place that could work for me 24/7. So if I had to manually follow up with each person, they’ve had to wait for hours while the time zone difference allows me to. They can just carry on through the process and the journey without needing me. There’s 8 hours difference with California and me in the UK, so that’s a long time to wait if I’m asleep and they want info right now! If they replied while I was sleep, or at my full-time job… they’d have to wait some more. It’s a constant battle of back and forth hoping you can actually have a conversation and find a right time to connect. Have you ever struggled with that too? This is a lifesaver, trust me! What having a follow up system looks like, is having a set of emails that can automatically go out as soon as someone opts in to get your freebie resource they want to download. You could have 3, 4, 5, 10, 20 even, emails lined up that gives more great value, introduces yourself to let them know more about you. Has a way to then offer your specific product you sell to them. All automatically without you needing to do things manually. The beauty of it, is it doesn’t have to be one-to-one. Think about how much time it takes you to have conversations on Messenger for example. You might be jugging a few messages at a time with different people. But you only have so much time in the day and can only talk to so many people when it’s done this way. This was something I massively struggled with in my early days of network marketing. With working 40 hours a week in my job, plus commuting, cooking, running a household, sleep etc. I was so limited to how much time I could spend on speaking to people that it was hard. Getting ignored, having an agenda. Talking to strangers! And it’s not hard to set up. Many people have said to me that they can’t do this online stuff as they’re not technical at all! Man, I’ve got friends who could barely even copy & paste and they’ve done this and killed it in their business ever since! So if you’re technically challenged 😉 then you don’t need to worry. In my beginners to email course, I cover every tiny step of how to set this up. Showing you exactly how to do it, what to click on, etc. so it’s all covered. If you’re interested to get started using Email in your business with what I’m sharing in this post, then check out the resources section at the bottom of this post. If you’re in network marketing, coaching or something where you want to actually talk to people… then this is perfect for you so keep reading. On your blog, you can have a way that gets people to actually book themselves into your calendar to talk to you. They can apply to work with you! Imagine that, someone is applying to join your network marketing team. Or becoming a client for your business. Going through a couple of steps before they even book a call to talk with you! Now this won’t be just anyone random… wasting your time. People who choose to do this, will be seriously high quality prospects. Meaning you’re only talking to people who are serious about finding out more about your business. If they go through the steps you will set up, by the time you hop on the phone, or on a video call with them, they’re almost good to go to sing up for your business. Or if you sell high priced products, this is perfect and they’ll be nearly there ready to buy with credit card in hand! I talk more about some of the simple funnels that you can use in this post. A ‘funnel’ is another word for a process that people go through to become a lead, or a customer etc. They can take themselves through your process and hop on the phone or video call to learn more. How different would that make your business if you have people doing this and you had multiple people to talk to each day who had requested a call with you? Imagine waking up to notifications of 10 new highly qualified people to talk to each week without you needing to do cold calls or messaging random people online? Would that change how your business ran? It did for me and that’s why it’s so powerful having a blog. It may start with a blog post about something your reader was looking for. Or maybe you shared it on Facebook and they saw it. But it’s what happens after is where the magic happens. The sad thing is not many people are doing it or they don’t have all the pieces there to make the most out of it. Some start a blog as a hobby and that’s fantastic, you’re half way there. Now you can monetise it and make it profitable and give you some extra income. That’s where the follow up piece comes in. Some people may just be getting started and need help with how to set it all up. Then grab my online recruiting course today. You’ll get even more insight and details of how the process works and fits together in this video series. It’s how I got started when I was a struggling network marketer who was fed up of spending my entire life on my phone messaging people trying to find interested people who may want to take a look at my opportunity. Or finding new customers so I could actually clear my rising debts, rather than adding them to it. This was my answer and I want you to have the help you need to get out of that struggle too. Click here to sign up now and you’ll get sent your first lesson right away. I’ll be covering more about having a blog for your business in future posts so make sure you keep in touch and look out for future posts. This is just the beginning for you and I couldn’t be more excited! What Funnels For Network Marketing & Affiliate Marketing Do You Need? Automated Selling Machine - My Beginners course to Email Marketing. 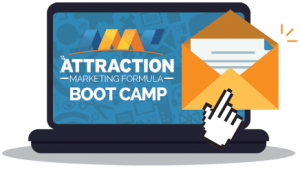 From setting up your software, to creating your perfect lead magnet to build your list.